What’s the best use of any Saturday? Racing wieners, of course! On Saturday, September 30th, head over to Yards Park for all the wieners! Wiener dogs that is, or miniature Dachshunds, or sausage dogs, or whatever you like to call yours, as they participate in the sixth annual Wiener 500 event. 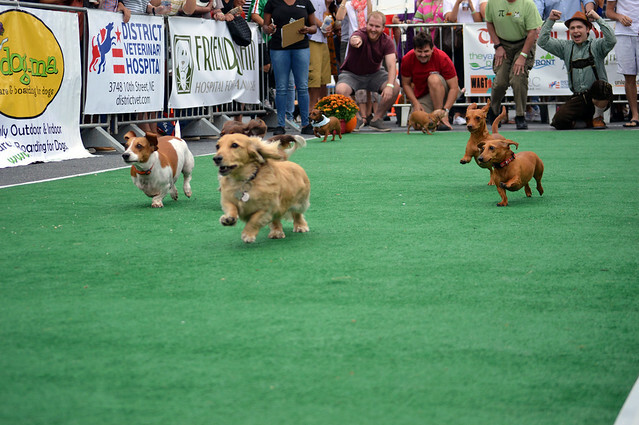 You can spend your Saturday witnessing the long, energetic Dachshund races, eat from local food trucks, sip on some Sam Adams Octoberfest Beer (while joining the stein hoisting competition) and listen to live music. The voice of the Capitals, Wes Johnson, has the race play-by-play call. Your fastest wieners can win a piece of the $500 pie ($150 first place) and other prizes. Last year almost 100 wieners ran for a good cause. Besides the obvious benefit of making everyone smile, proceeds to enter the race will benefit the Humane Rescue Alliance. Register your pup to race here. Family-friendly but 21+ to drink the beer.